Yu Shi Wen can skip her judgement and drawing phases and select any other character. Ye Shi Wen then attacks this character. Ye Shi Wen is immune to fire damage. "Sprint" is identical to the first option of Xiahou Yuan's "Godspeed." 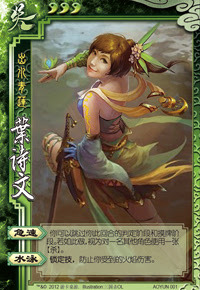 If Ye Shi Wen skips her judgement phase when activating "Sprint," she does not need to flip judgement cards for her pending judgment cards, but these cards are not removed from her judgement area. As a result, they will remain there until Ye Shi Wen chooses to not use this ability or another character removes these cards from his judgement area. Ye Shi Wen can choose to use the ability of an equipped weapon when using "Sprint." When Ye Shi Wen uses "Sprint," her attack is considered to be colorless (not stopped by Black Shield) and has no elemental attribute. Note that "Swim" is enforced. Ye Shi Wen cannot choose to not prevent fire damage done to her. With the Wood Armor equipped, Ye Shi Wen is nearly invincible due to "Swim." She enjoys all of the benefits of this armor without its weaknesses. When she has this armor equipped, she can only be damaged by Lightning Attacks, Lightning, Duels, and character with non-fire direct-damage abilities. In some situations, "Sprint" is useful. At the right moment, Ye Shi Wen may be able to kill a weak enemy. With only three units of health and two weak abilities, Ye Shi Wen is one of the most fragile characters in the game. Only 5% of the cards in the deck (with the base set and the Battle Expansion) cause fire damage, so "Swim" does not offer much protection. "Sprint" forces Ye Shi Wen to skip her drawing phase, which is expensive given the fact that she has few units of health. Liu Bei/Guo Jia/Lu Su - These characters can help Ye Shi Wen by replenishing the hand cards that she forfeited by using "Godspeed." Chen Gong/Zhang He/Zhang Zhao & Zhang Hong/Wu Guo Tai - These characters can help Ye Shi Wen acquire the Wood Armor with their abilities. King With a base health level of only three and a weak defensive ability, Ye Shi Wen is a weak king choice. Loyalist Due to her weak abilities, Ye Shi Wen usually will not live long enough to help the king. Rebel Ye Shi Wen is a poor rebel choice because she is fragile and this role has a three card bounty. Spy Ye Shi Wen is a poor spy choice since she cannot last a long time or turn the tides for the weak team. Ye Shi Wen is like a 'powered-down' version of Xiahou Yuan, which is very unfortunate because Xiahou Yuan is already not one of the stronger characters in this game. If we had to guess, we would have thought that the thought process behind creating "Swim" was that since Ye Shi Wen was an Olympic swimmer, she is always in water and hence she is immune to fire. How lazy. This is not a good way to honor China's 2012 Olympic champions.